Synthetic hair or horse hair. 1. 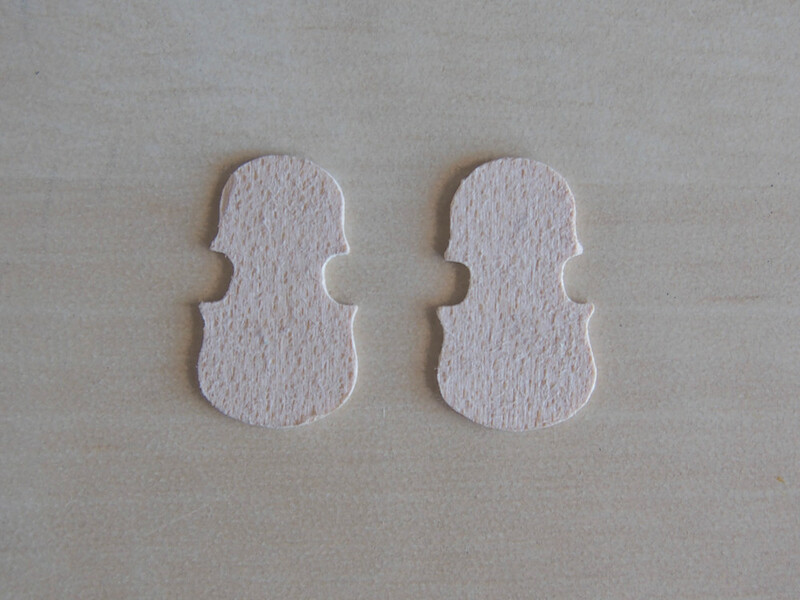 The body of the violin is made of three parts. The upper layer, the bottom layer and the middle (as shown in the diagram above). Cut the middle of 2mm thick bass wood. 2. You must now shape the top and bottom pieces to give the surface a curve. Do this with sandpaper. You can see in the above right image the first stage of sanding. 3. 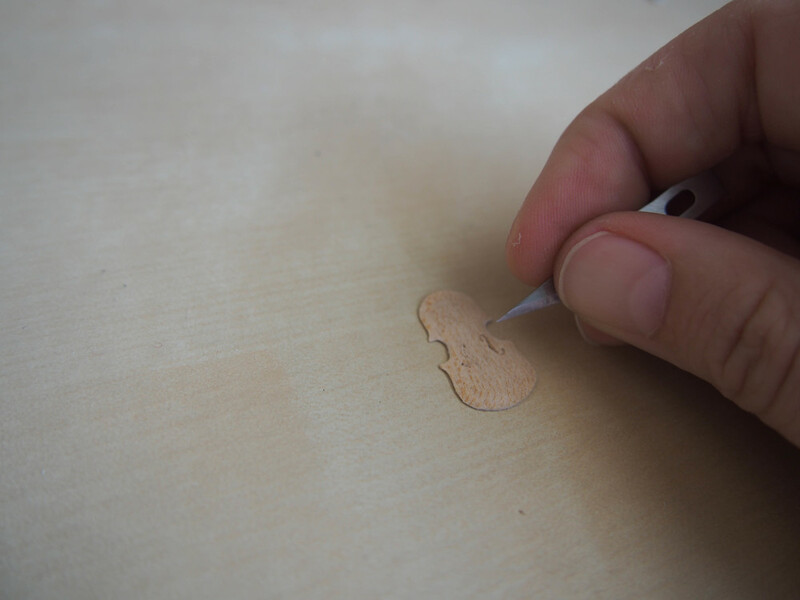 Now you must carve the "F" holes in the front panel of the violin. Do this with a very sharp blade. 4. Once you have carved the "F" holes, cut a section out of the middle piece (above right). This will allow the violin to appear hollow inside. 5. Now cut out the neck and carve the scroll as shown above. refer to images of actual violin scrolls for guidance. chin rest in 1mm thick wood. 7. Each of these pieces must be sanded into shape. You can see the shaped pieces above right. 8. Now you must cut four small rounded pieces for the pegs. This can best be achieved by slicing a thin dowel piece like a salami. 9. Attach the peg stems by gluing a smaller piece of dowel to each peg piece (above left) and then cutting it down after it is glued (above right). 2. Cut about 6 lengths of synthetic hairs or horse hairs for the bow hair. Glue the ends together at both ends. 3. Glue the bow hair to the tip and frog of the bow, trimming the excess with a sharp blade. TIP: If you look closely at a violin bow you will see it is ever so slightly bent with the pressure off tightening. If you build this bend into your bow by sanding it will give the bow a more realistic shape.